In war there's death, destruction & fear, there's also a lot of silence that's usually invaded by the horrific reality & morbid thoughts one tries to escape. What will happen if of all of those gathered in one place to haunt you every night? The war started in 2011 and since, it never ended, consequently many other things start along with it; death, destruction, hunger, tragedy after tragedy, but never seem to end. My understanding of life is that it's supposed to be a series of ups and downs, but apparently in some unlucky cases, it's just a down followed by a deeper down towards the bottomless pit of indefinite suffering. Writing this in my room, in my family's house, we're always surrounded by the atmosphere of war. Because of the continuous fighting in parts of the city. We're few of the lucky ones though who didn't have to evacuate, the buildings might get hit by stray bullets every once in a while, but that's about it. The thing about civil wars is that you're many things at once, you're a victim, a target, a participant, a refugee, & a citizen. Your identity is constantly changing & you never quite know what you should think or feel, you just try to adapt the best way you can to anything you're hit with. I can adapt, my mom couldn't.. so she left, left the city, left us, left most of herself.. and chose to live quietly in a rural area near the desert, "it's so quiet." She says. So quiet her head is making up the sounds of war she thought she had escaped. My dad though, he's what I like to call "An anchorless ship", he just follows and stays with whoever of us he deems sane at that moment. The rest of the people here, including my two siblings and I, spend their days busy going through the "adapting" part, trying to figure a way of life when everything is basically crumbling down around you, trying to piece together something close to what we view as a Normal Life, it's not easy, but it's possible, especially since it's an acquired skill that you can develop as you're continuously hit with new challenges & circumstances that keep making you reconsider your priorities & path in life on daily bases. This is what war brings, even if you are not directly involved in the fighting, the rules still apply to you, What rules ? Survival is a priority, anything else falls behind. You need the mentality of a soldier to maneuver around all obstacles in your pursuit of life, you need to emotionally separate yourself from many of the tragedies & obscurities surrounding you, because there are so many of them that if you stop to indulge in sorrow & desolation, you'll be as good as a sitting target. Some disagree, like my mother, they believe that overlooking mishaps is as bad as committing them, that limiting our sympathy is nothing but abandoning human qualities. The laughter I'm hearing from my window of children playing outside & the noise of car horns stuck in traffic , are these considered a cold hearted deviation from humanity ? Or is it strong human will conquering a bad situation & refusing to be consumed by purposeless thoughts of misery & distress ? I wonder, does it escape them? how we cannot really run away from what we feel, rather we merely bury it, humans can't abandon their humanity. It's simply buried & for every person it's only a delayed resurrection of everything they thought they've evaded. For me, that said resurrection is every night.. that's where my thoughts are haunted by the things I restrained during the day, and so during the day I find that I am either absent-minded in parallel realities, angry at things in ours, or occupied with idle matters, it rather appealing & comforting compared to be being slowly dissolved in worries & desolation every minute of the day. When it'snight time though, it's the dreadful return of the inevitable. It's terrifying, depressing, and so.. quiet. Every night feels like how that time preceding the apocalypse is always described, all agony coming to an end with one final blow of more agony. Suddenly, everything is heavier, breathing itself is a struggle, your body feels like you're sinking deeper and deeper, and thoughts, become the most consuming burden you carry. I subconsciously try to do what I've trained myself to do, separating myself emotionally, so that my body would be as quiet as the night in a war stricken land can be, needless to say, it's useless. Then it creeps further to my consciousness through all of my defenses, my own distributer of silence, residing the empty room next to me, the resurrected constant devastation of every thought & feeling I have, & everything I am. The story is shorter than whatever I ended up telling..there was a mother, a father and three children, they were visiting their grandparents out of the city, but roads were blocked and they got stuck in a town on the way back, and the fighting kept getting more closer to them.. with no escape, the father managed to phone: "We're ok, can you send us food and clothes just in case ? ", That was 3 years ago & the bags of food and clothes are still in that maybe-not-so empty room that's keeping me suffering, human, & awake. 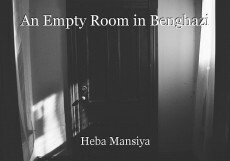 © Copyright 2019 Heba Mansiya. All rights reserved.